Flix Brewhouse, the only first-run cinema in the world with a working microbrewery and HomeField Grill, Williamson County’s largest scratch kitchen restaurant, announce the first ever beer festival in Central Texas based strictly around firkins. The inaugural Firkin Fest features ten Texas craft breweries and will be celebrated Sunday, April 21st from noon to 4 p.m. in the Sky Ridge Plaza parking lot at IH-35 and Hesters Crossing in Round Rock. Breweries from the area will be at the event with their firkins of rare and specialty beers for attendees to enjoy. 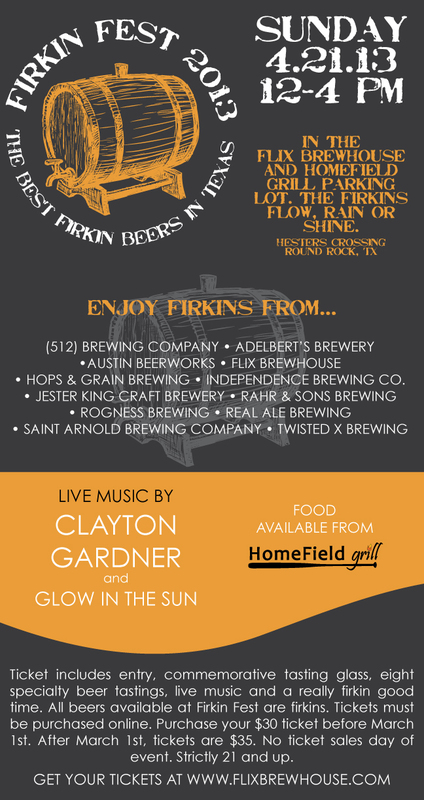 Participating breweries include (512), Adelbert’s, Austin Beerworks, Flix Brewhouse, Hops & Grain, Independence, Jester King, Rahr & Sons, Real Ale, Rogness, Saint Arnold and Twisted X.
Firkin Fest tickets include entry, a commemorative tasting glass, eight specialty beer tastings and live music from Clayton Gardner, Texas Radio Music Award nominee for best new male vocalist of the year, and rock band Glow in the Sun. Tickets for the event are $30 before March 1st and $35 after March 1st and are available at flixbrewhouse.com or at the Flix box office. Tickets must be purchased online or in advance as there will be no ticket sales the day of the event. Firkin Fest will happen rain or shine and is strictly age 21 and up.